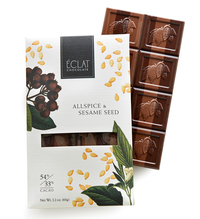 Allspice & Sesame Seed Chocolate, 2.2 oz / 60g (Eclat Chocolate) - Penn Herb Co. Ltd.
Éclat Chocolate Parallel Bars are inspired by nature, creating a symbiotic relationship of classic flavor. Through innovative design, this bar takes you on an incredible and ever-changing chocolate journey that awakens your senses. Dark Chocolate (min. cocoa mass 54%, sugar, cocoa butter, soya lecithin, natural vanilla), Milk Chocolate (min. cocoa mass 33%, sugar, cocoa butter, whole milk powder, soya lecithin, natural vanilla), Sesame Seeds, Allspice. Produced in a facility that handles peanuts, tree nuts, milk, wheat and soy.